We believe that sustainable agriculture must result from a healthy balance between environmental responsibility and our plant protection products. This is why IQV provides agricultural technologies and solutions that respect the environment, helping to guarantee yields, reduce risks, improve product quality and optimise the use of natural resources. Discover our wide range of products. With over 7 billion people on the planet, natural resources may become depleted. This is why broad-based, sustainable growth is the only acceptable model for our company. Here at IQV we know how important sustainability and respect for the environment are; this is why our business optimises natural resources and minimises their impact on our ecosystem. 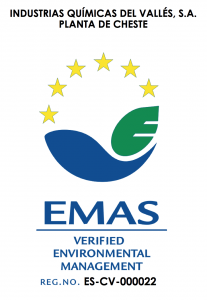 IQV certified according to EMAS.